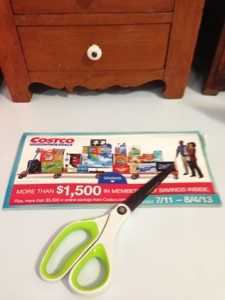 The new Costco coupons start today. Again, Kimberley over at Addicted to Costco has posted the coupon book PDF. Don't print these out; copies don't work. If you didn't get this in the mail, ask at the service desk. I'm tempted by the Haagen Dazs ice cream bars and the Starbucks frappuccino. I definitely will take advantage of the Palermo Pizza offer. Most of the coupons are for brand name items; and, since I try to use Kirkland, most of this is not for me. I wish they would bring the gelato back to West Nashville- coupon or no coupon.